When is Ash Wednesday? Wikipedia tells me it’s the first day of Lent, which is 46 days before Easter. This means it can be as early as February 4 or as late as March 10. 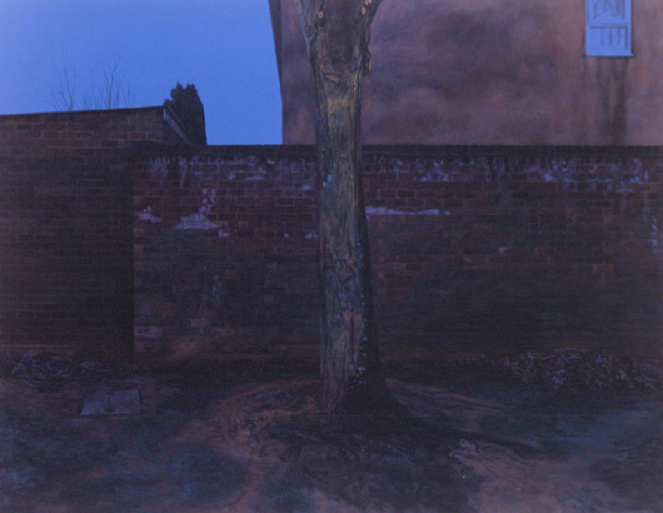 George Shaw’s ‘Ash Wednesday’ was on show at the Wilkinson Gallery (Anthony now being in partnership with his wife, Amanda) in the East End of London from May 12 to 26 June, 2005. So it’s likely that the paintings, if they were based on photographs taken on the day in Tile Hill - which I imagine they were - were taken on February 25, 2004, especially since the paintings are all dated 2004/5. Lots of musing about units of time in that quote: from half-moments to years. It reminds me to take my time as I go through this fascinating work. Perhaps I should say that I began to research this page towards the end of December, 2012, but chose to break off for the holiday season. I’m actually writing these words on January 25, 2013, and will carry on doing so for as long as it takes. February 25, 2004, George was up early that day, because the seven paintings that make up ‘Ash Wednesday’ are based on photographs taken at half-hour intervals from 6am to 9am. Here is the six o’clocker. Taken when the sun was still to rise and George must have felt he had the estate - indeed the whole world - to himself. Grass, tree, wall, house, window, sky. Given what I quoted from the press release above, the artist may be thinking of this spot as he’d known it in earlier years. 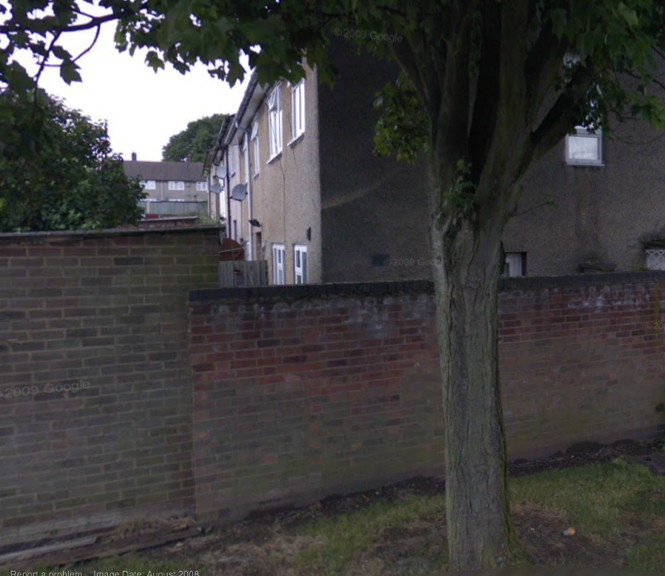 Looking at a map, I guess this tree/wall combo would have been on his route to primary school, and he’d have passed it dark like this throughout the winters of his childhood while ‘creeping unwillingly to school’. He wouldn’t have been here at this time in the morning though. Why is adult George up so early again? ‘I fill the hours and days with work that lengthens the twilight of the day by minutes.’ Perhaps for that reason. The Google camera did not take that picture on Ash Wednesday, not with all the foliage on the trees. Is there such a thing as Sycamore August? Well, there is now. I don’t think the priest of Tile Hill is up yet. Unless he lives in that house whose gable end shows a light. I expect he’s sighing at the thought of the number of kids he’s got to put the fear of God into that day. Though to be fair, I mean the fear of death. So how did George feel about this? Is that what today (the day I’m writing) is destined to be - a journey towards darkness? At this point in my analysis, it seems like a journey out of darkness. That may prove illusory, but the exercise is going to end with a seventh painting, based on a photograph taken at noon, so I remain optimistic. 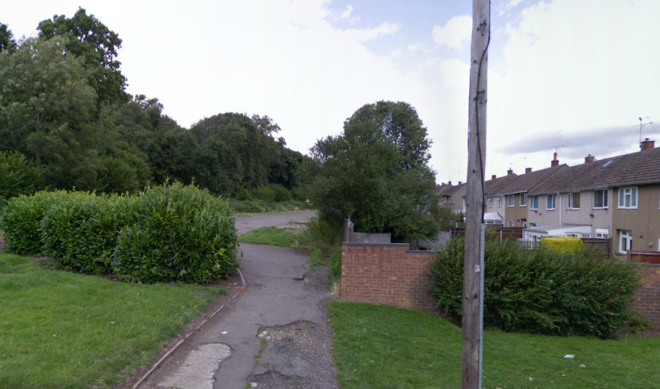 I can’t quite get to the exact viewpoint of the 6.30am painting on Google, because (as mentioned in the ‘Of Innocence’ page) Hawthorne Lane carries on as an unmade up track which Google Street View can’t follow. So the house with the light is a bit further up the track, tantalisingly out of sight. But that’s all right. 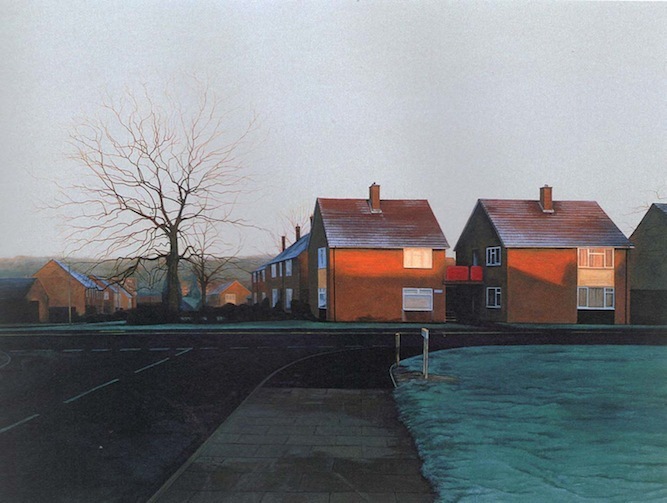 I feel Google’s ‘Ash August’ and my ‘Ash January’ is following doggedly in the tracks of George Shaw’s ‘Ash Wednesday’. I hope the reader feels that too. I said I’m going to take this slowly, and I meant it. I’m going to tease this out every step of the way. The commitment that George Shaw has shown towards his Ash Wednesday deserves no less. 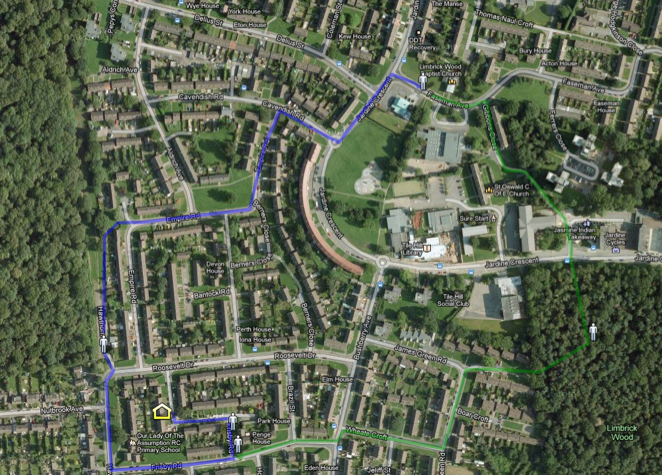 So here is a map of Tile HIll. The yellow house symbol shows George’s starting point. 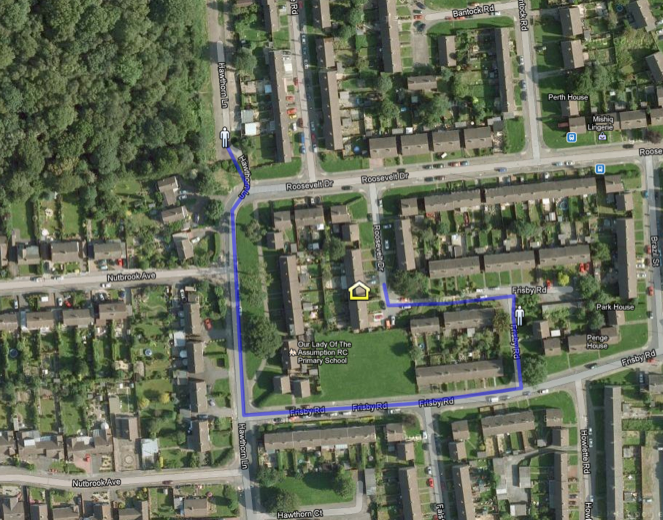 Follow the blue line to where he took his first photograph at 6am (he faced west when taking it). Keep following the line until you get to the figure facing north on Hawthorne Lane. Actually, I was never happy with this as being the actual site for Ash Wednesday: 7am. Why are the screens that are linking the houses blue? (Perhaps because they’d been painted in the four-year interval between George Shaw taking a photograph and Google taking one.) Where is the magnificent tree? (Perhaps chopped down.) Why has the artist simplified the layout of windows in the houses? (Perhaps for aesthetic reasons.) But deep down I knew this couldn’t be the actual site for one simple reason. The sun doesn’t rise in the west, which is the implication of where the light is falling on those houses joined by the red screens. True, George’s original photo could have been taken in the evening, at sunrise. 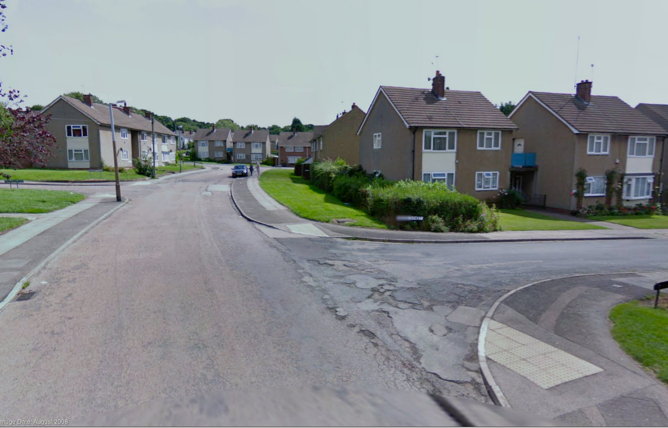 But if so Shaw’s Tile Hill project really would dissolve on the spot: ashes to arbitrary ashes; dust, to pointless dust. What’s neat about this site is the connection to the pub paintings that I finished the ‘Of Innocence’ page by making a meal of. 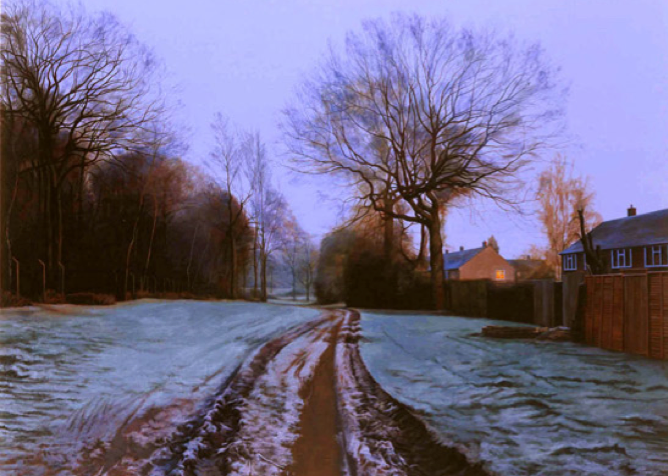 George Shaw was standing between those cars on the right when he took the photograph that Christmas Eve was based on. And he was standing in the left background when taking the snap that would become The Black Prince. 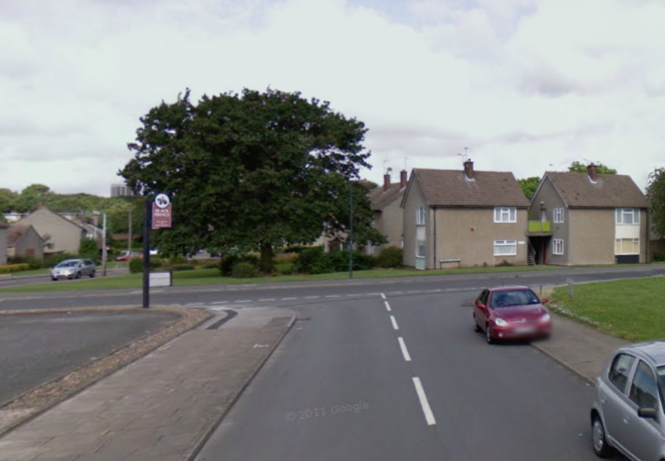 In other words, the pub is situated just out of shot, left foreground. Of course, in painting Ash Wednesday: 7am, George didn’t fiddle with the window layout of the houses. (Why the hell would he? ‘Aesthetic reasons’ indeed!) 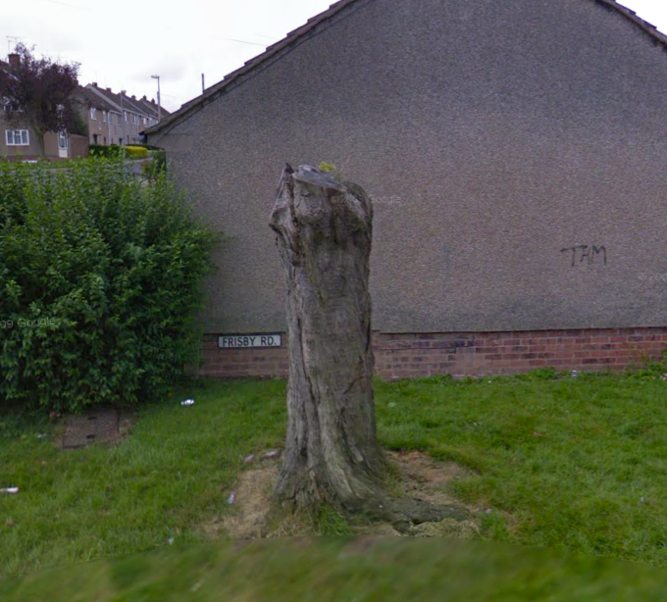 Nobody has chopped down that tree (not yet anyway). And all is right with the world. 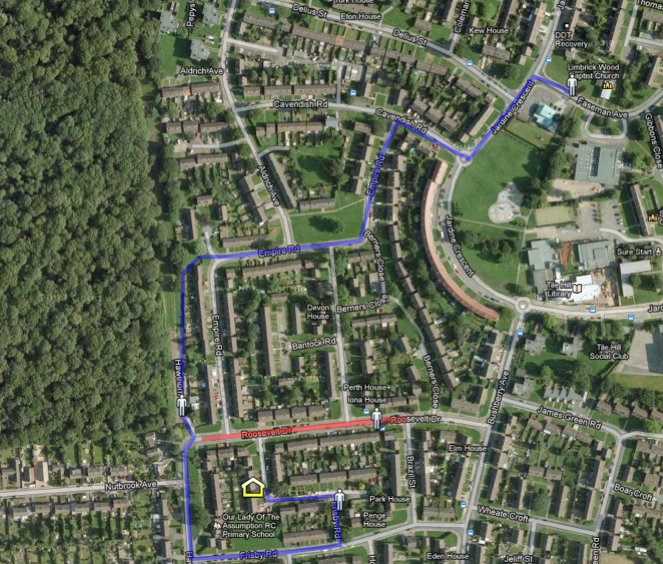 Just to clarify, George did not walk the red route and record the scene looking west onto Brazil Street, where two houses are connected with blue screens. He continued on the blue line. Well, no I don’t know his exact route, I’m simply indicating the most direct way by foot between photo stops. He took the photo that would become the timeless 7am painting while standing on Faseman Avenue looking east towards Jardine Crescent. If the shadows in the above Ash Wednesday: 7.30am painting are falling from bottom left to right (and there is almost as much evidence to suggest that they're falling the opposite way, from top right to left) then the artist is facing south. But is he in Tile Hill Wood or Limbrick Wood? The best clue would be to locate where the Ash Wednesday: 8am picture was taken and see what that suggests. 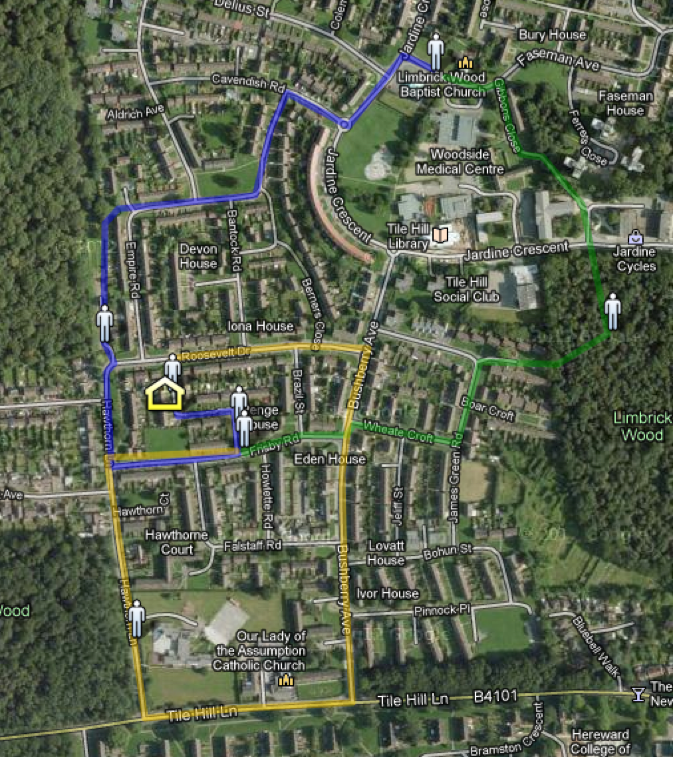 So that's what I've done in the map below, extending George's travels with the use of a green line. All very conjectural, of course. What's for sure though, is that George was close to home by the time he took photograph five, very close to where he took his first photograph on Ash Wednesday. Let’s face it, he probably popped into the house for some breakfast at this point. Or at least a mug of tea. 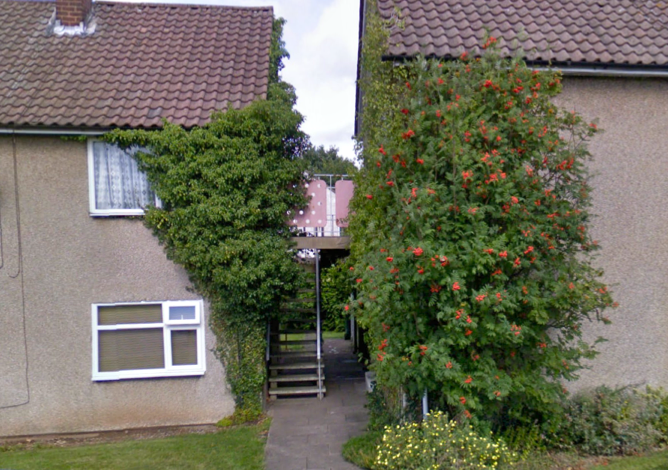 I suppose I’d better prove that the site I’m suggesting for painting five is where I’m claiming. 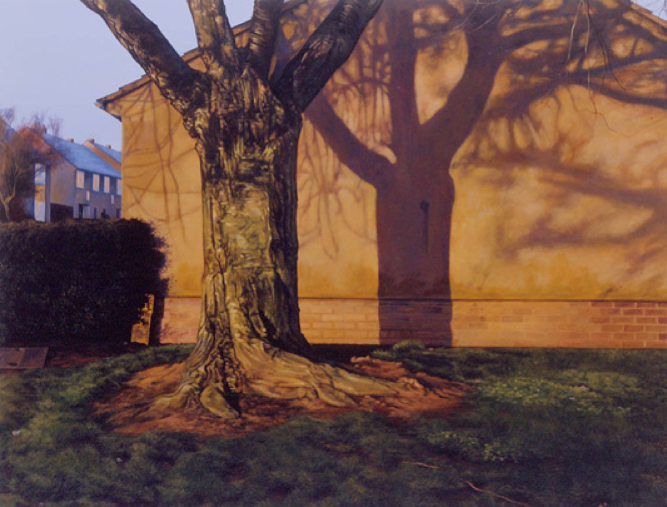 Below is the picture, the eastern sun casting the shadow of a magnificent tree onto an eastern-facing wall. Not so magnificent a tree come August 2008, as the photo below demonstrates. I wonder if Tam cut the tree down. Your day will come too, Thomas Hardy! 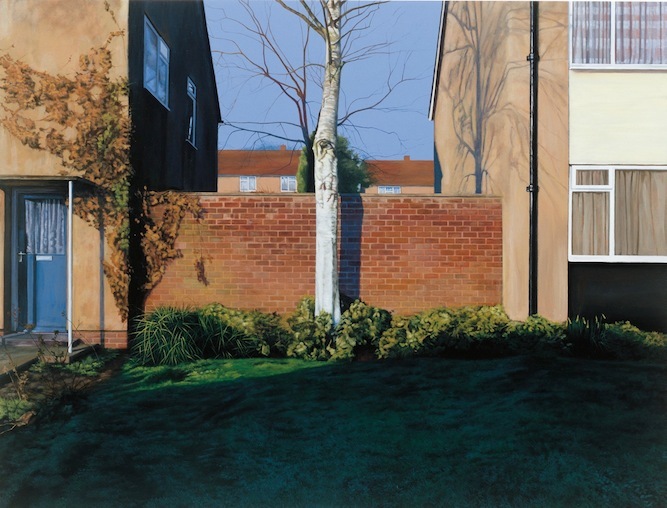 This is the second of three occasions that George Shaw zeroes-in on the ‘tree-in-front-of-a-wall’ motif that Ash Wednesday morning. And on each occasion the tree/wall combo was close to his home. Could this be another hidden motif in the work? If so, what’s behind it? Gordon Burn tells us that George Shaw senior worked in the British Leyland factory in Coventry until he was made redundant in 1979. Being laid off coincided with a heart attack and he didn’t work again. Young George would have been 13 when his father stopped going to work, so he would have had to get used to his father being around the home as he moved into his teens. 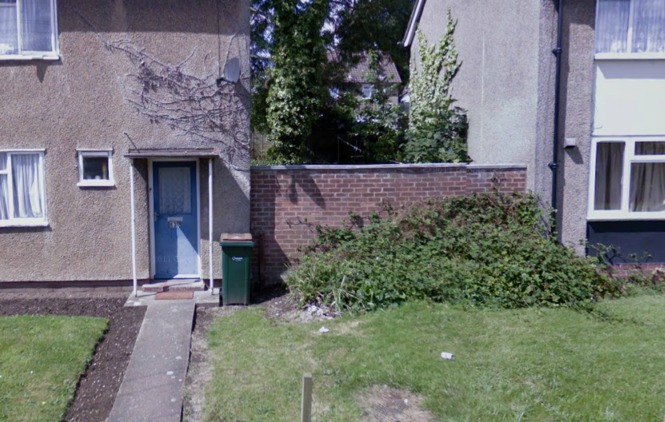 Father, mother and three younger children all shared the one terraced house. Still, it seemed to work for them, perhaps because the parents were fair-minded and managed to give George enough space to grow. And I can imagine it still worked that day in 2004 when George embarked on his Ash Wednesday adventure, not sweet 13 any more, but a solid 38 years-old. As the road markings in the painting indicate, we’re a yard or two from the gates of a school, George’s Catholic primary. Come ‘Our Lady of the Assumption’, shine for the children! Oh yes - bloody good idea - mess with two of the strongest lines in Shakespeare. Made even stronger for me when I read recently, that ‘golden lads’ used to be a Warwickshire term for dandelions in full bloom and ‘chimney-sweepers’, a local term for dandelions at the ready-to-blow stage. The tree on the right looks as if it's been blown. But the sky is a reminder of how the plant looked in its prime. I will try to move on. Wow - better still! - invite comparison between George Shaw’s jewel of a painting and a particularly insipid (and, towards the bottom, blurred) snap of Google’s. The last painting comprising ‘Ash Wednesday’ was made from a photograph that George took when he was nearly home again. Just along from his house is this wall connecting two houses. And in front of the wall grows a silver birch. 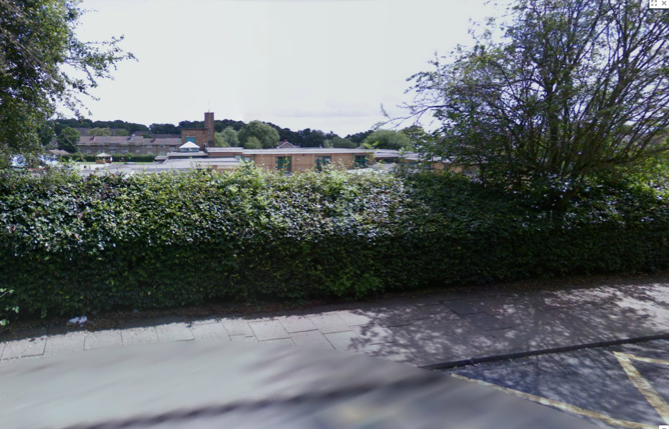 As the photo below shows, there is no sign of the silver birch of Ash Wednesday: 9am come August 2008. I’ll say more about this at the right time, which is in the following page called 'Woodsman'. Why is 9am the last painting in the series? Partly because that is the time of the Ash Wednesday service. 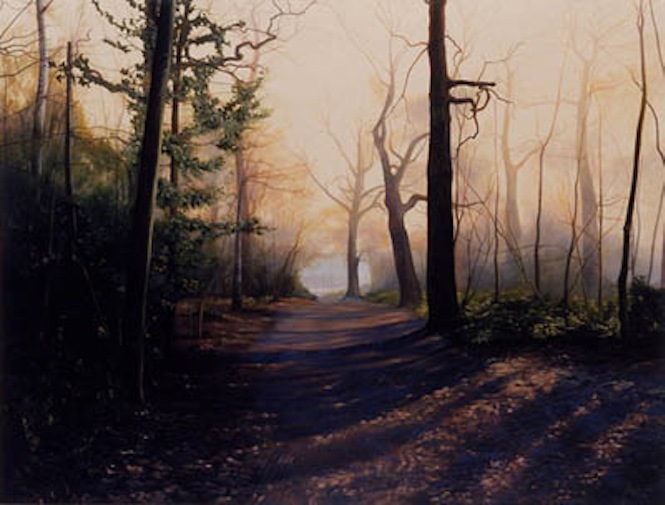 In a way, the paintings are of the golden period in the day before the priest put the mark of death on George Shaw’s forehead. 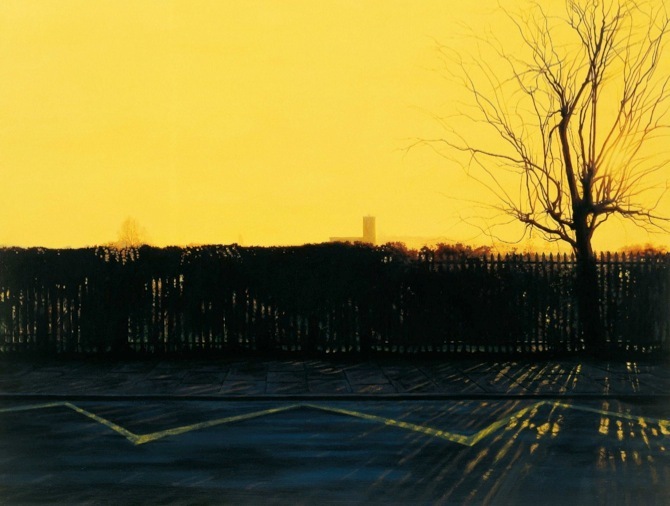 So that (yellow line) completes the circuit that George Shaw may have taken early on Ash Wednesday, 2004, in search of innocence and immortality. What about the way that the paintings were set out at the Wilkinson Gallery the following year? Was the chronological order or the shape of the walk conserved? Not directly. The seven paintings were divided between three galleries. The main front space contained the first painting (6am), the third (the one I had difficulty tracing) and the sixth (blinding yellow light); in other words, the strongest possible set of three. The back space on the ground floor contained the second painting and the final one. While the upstairs room contained the fourth and the fifth paintings (in the woods; plus shadow of tree on wall). Now I think about it, each room contained one of the pictures set close to home. That may or may not have been the rationale for the arrangement. There is a poem called Ash Wednesday by TS Eliot, written in 1930. Apparently it was his first long poem after converting from Unitarianism to Anglicanism in 1927. Did George have it in mind when he put together the otherwise atheistic notes for his own ‘Ash Wednesday’? After the Ash Wednesday recital, the Eliot scholars descend from the red, yellow or blue-screened platforms (or ‘pulpits’ as they’re known locally), and make their way to the Black Prince where a free pint of lager awaits all those who present either a Faber & Faber copy of Ash Wednesday, a Penguin edition of The Woodlanders, or a potlet of Humbrol red gloss enamel paint.